The truth is the changes we’re experiencing now started in the late 20th Century and have come to the fore in the last five years. Businesses that have adapted to and adopted the profound changes are the ones that are not only surviving but are outperforming their competitors. They are led by business owners able to create sustained growth and protect their hard-earned wealth. These companies have adopted what Birol Growth Consulting calls the 21st Century Mindset of Sustainable, Profitable Business Growth. They succeeded by reducing their costs, maintaining deep buyer relationships and delivering low prices, high quality and outstanding service. In the 21st century, the most successful private businesses have evolved from creating more capacity to becoming more flexible. They are able to adapt to and meet customer outcomes even before customers recognize they do. But now there are so many new opportunities, but only the most nimble and forward-thinking firms are succeeding. They invest in the future rather than rely on historical returns to predict future results. Have you adopted a 21st Century mindset? Today’s success means being a profitable and sustainable business that can do what it wants, when it wants, and with whom it choses to. This business no longer counts on the 20th Century model of building and keeping wealth. 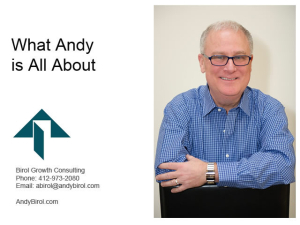 Why must owners create sustainable profitable growth? Owners must run their firms as if they were owned by outside investors so they never have to be run by outside investors. How so? 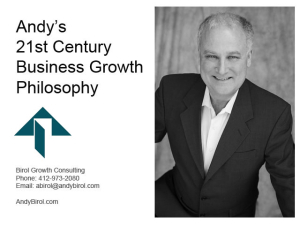 Birol Growth Consulting empowers private business owners to create 21st-century sustainable profitable growth. 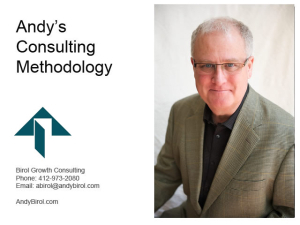 Whether I’m consulting with you and your team or focusing just on you through our business owner coaching, our process leads to the same results: 21st Century sustainable growth and beyond. Maximize the business owner’s Best and Highest Use to refocus on goals and the desired future. Hear the voice of your customers and incorporate their ideas and needs — value they’ll pay for — into your growth plans. Develop your go-to market strategy. 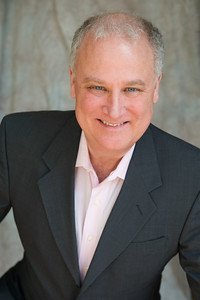 If your firm is stuck or you need to empower its future, contact me today. Lets partner in developing your business growth. For Meeting Requirements click here.